In small amounts, however, ionizing radiation does not do significant harm, and in fact, it’s a part of our everyday life. Ionizing radiation that naturally occurs on our planet is called background radiation and is a natural part of our planet’s environment. Background radiation can come from all kinds of things, including cosmic rays from outside our galaxy, radioactive materials in the earth like uranium and radon, and even radioactive materials in our body, such as certain kinds of potassium and carbon atoms. Identify the kinds of radiation in your cloud chamber, then measure the amount of background radiation. When ionizing radiation enters a cloud chamber, it interacts with atoms in the atmosphere — like hydrogen, nitrogen, and oxygen–by violently knocking off their electrons. Those atoms turn into positively charged ions, which are very attractive to the gaseous alcohol molecules in the cloud chamber! 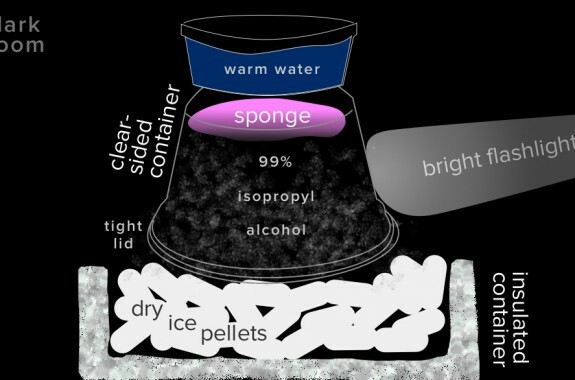 Chilling the cloud chamber on dry ice causes those gaseous alcohol molecules to crowd so close together that no matter where in the chamber ionizing radiation strikes, there will be many alcohol molecules ready to stick to the trail of positive ions it produces. The result is visible trails of condensed alcohol mist wherever ionizing radiation comes into contact with atoms in the air. Thanks for posting this detailed information I am trying it tomorrow!